I’ve been wondering about putting an actual recording of me doing one of these songs for a while. The real problem is that I really don’t sing well – I know that, and know my limits. But with the recent passing of David Bowie, and with a number of his songs on this site, I thought I’d give it a go. So here it is – my version of “Heroes” (to join the 27,392 others on YouTube!). This may be the very last time that I do this, so make the most of it! There’s nothing else that I could post today other than something by David Bowie. Like many this morning, I was shocked by the news of Bowie’s death. I don’t remember being so affected by the death of a public figure. Like a number of comments I’ve seen today, there was an almost unwritten sense that he was immortal, this otherworldly man who seemed different in so many ways to the rest of us. My first real connection with Bowie was when Ashes to Ashes was released and got to number one, with its strange sounds, strange video and slightly unhinged lyrics. I was just getting into music in a serious way, and here was the real deal – music both strange and beautiful, different to everything else around, and yet also strangely accessible. And so whilst I wouldn’t classify myself as a real Bowie-head, I dug deep into his past and discovered the multifarious catalogue that he had amassed through an amazing, unparalleled run through the seventies and into the eighties. From the amazing acoustic songs of Hunky Dory, the alien rock-god of Ziggy, the white-soul of Young Americans and the electronic sounds of his Berlin albums, Bowie was an artist and pop star unrivaled, skittering across the surface of culture, hoovering up influences, and pushing and defining the zeitgeist. At the time he was a marvel, looking back now it seems almost inconceivable what he achieved in that time. If he slowed down and lost the plot a little in the 80s its no surprise given what came before. And yet his latter day resurgence, with the achingly beautiful Where Are We Now, it’s attendant album (The Next Day) and finally what turned out to be his swansong (Blackstar) saw him pushing boundaries to the end, redefining himself even in death (see the video to his final single, Lazarus). I’m not going to argue that this song, Let’s Dance, is his artistic peak. It’s not. It was certainly his most commercially successful period, and there were some good – if not great – songs that came from those sessions. 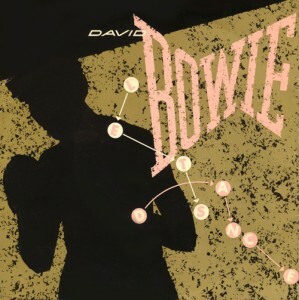 But there is certainly a joyous feel to this song that has lasted down the years (that’s another amazing thing about the Bowie back-catalogue – so much of it still feels so contemporary, even 40 years after it was recorded). And the joy that he brought is something that should be celebrated, as much as the strangeness, the challenging, the glam and the new. And so to the song sheet. It’s a relatively simple song in structure. There’s a few unusual chords in there, but there not tricky, and they give a really nice feel. The tricky bit is the rhythm, to capture that stuttering, syncopated funk sound of the original. I haven’t really had time to practice this properly so can’t give much advice. This cover by M.Ward potentially points to something that might work, but try it and see what you can do with it. Just – please – try and avoid the bog-standard ukulele strumming pattern. You’ll kill it! Categories: Pop, Rock, ukulele chords | Tags: 1980s, 1983, David Bowie, Pop, Rock, ukulele | Permalink.